Early ocean experience is a critical time period that affects juvenile salmonid survival. Understanding juvenile salmonid behavior in nearshore marine environments and how oceanic conditions (such as dynamic river plume habitats) affect salmonid migration will contribute to salmonid survival studies and conservation and management efforts. Relatively few studies have been conducted on juvenile salmonid behavior as they migrate out the mouth of the Columbia River and some studies suggest that juvenile salmonids typically migrate north immediately upon entry into the ocean from the Columbia River. We present findings from a study that used acoustic telemetry to determine the migratory direction, residence time, and travel rate of juvenile salmonids as they left the Columbia River and entered the marine environment. A total of 8,159 acoustic-tagged salmonid smolts were detected at the mouth of the Columbia River. Of the fish detected at the mouth, an estimated 16% of yearling Chinook salmon, 10% of steelhead, and 26% of subyearling Chinook salmon were detected on a sparse array deployed outside the mouth of the Columbia River in the vicinity of the plume. The travel rate of Chinook salmon smolts decreased as they left the river and entered the marine environment, whereas the travel rate of steelhead increased. Chinook salmon also spent more time in the transitional area between the river mouth and plume compared to steelhead. In early spring, yearling Chinook salmon and steelhead were predominately detected on the plume array towards the edge of the shelf and to the south. Later in the season, yearling Chinook salmon and steelhead smolts were more often detected north of the river mouth. Subyearling Chinook salmon were most often detected on the portion of the plume array to the north of the river mouth. Our study showed that salmonid smolt migration out of the river into the nearshore marine environment appears to vary across species, season, and age class, and may be influenced by local environmental conditions. Direction of movement upon ocean entry cannot be assumed and is likely influenced by oceanic conditions such as wind and currents. We also present, for the first time, the utility of the Juvenile Salmon Acoustic Telemetry System (JSATS) to monitor the behavior of juvenile fish in the marine environment. Our results will help inform future studies using telemetry and hydroacoustics as well as trawl surveys to assess nearshore ocean juvenile salmonid distribution, behavior, and survival. Various fisheries management strategies have been established to enhance salmonid populations that are currently listed under the Endangered Species Act of 1973 (ESA) in the US Pacific Northwest [1, 2]. Salmonid smolt emigration rate and survival may be affected by a range of ecological and anthropogenic factors including hydroelectric dams [3–5], predation [6, 7], physiology [8, 9], riverflow , and oceanography . In recent years, considerable effort has been expended to study salmonid smolt survival through the Federal Columbia River Power System (FCRPS) [5, 12, 13]; however, relatively few studies have focused on survival and behavior in the lower Columbia River, estuary, and nearshore coastal environments [14–17]. Studies have shown that smolt survival is reduced in the lower 50 km of the Columbia River [12–14] and that migration rate and timing of smolt arrival in the ocean may play a major role in determining marine survival [18, 19]. Estuaries are considered important rearing habitats for juvenile salmonids [20, 21] and river plumes are the first feature encountered upon entering the ocean. Juvenile salmonid downstream migration rate and residence time in estuaries and the transitional area between fresh and saltwater has been shown to vary across species and populations [22, 23]. It is believed that juvenile salmon continue to rear as they migrate out of the freshwater towards the ocean and use river plume environments as rearing habitat [24, 25]. Local conditions in nearshore marine environments experienced during the early ocean time period are critical and likely one of the greatest determinants of marine survival of juvenile salmonids [19, 26–29]. The Columbia River plume varies from 2 to 11 × 1010 m3 in volume and during spring and summer, often shows a bi-directional pattern, extending north and south of the Columbia River mouth along the Washington and Oregon continental shelf and often farther offshore, depending on season and physical conditions [30–32]. Plume conditions and structure can be highly dynamic [30, 31] and likely influence juvenile salmon distribution, behavior, and survival [6, 27]. Past studies have described juvenile salmonid distribution, abundance, and ecology in the Columbia River plume [24, 33, 34], although much of this research was based on samples collected from trawl catches and does not present a high level of behavioral detail. Recent telemetry studies [35–37] tracked the movements of juvenile Chinook salmon (Oncorhynchus tshawytscha) and steelhead (O mykiss) from the Columbia River and into the plume, forming the current assumption that smolts predominantly migrate north after exiting the river. While the work completed in these previous studies was informative and revealed important results, there remains opportunity to expand on these findings and provide additional detail on smolt migration behavior at ocean entry. We hypothesize that although juvenile salmonids may not migrate a long distance south after leaving the river, some fish may migrate south (potentially in response to local oceanic and plume conditions) before reversing direction and moving north. The Juvenile Salmon Acoustic Telemetry System (JSATS) was designed to study smolt behavior and survival throughout the Columbia River watershed and FCRPS . This acoustic telemetry system provides broad scale utility for juvenile salmonid research due to receiving and transmitting capabilities in both freshwater and marine environments. The JSATS is a useful tool for studying migration of small-bodied, anadromous fish migrating from rivers into marine environments. The objectives of our study were to determine the travel rate, residence time, and migratory direction of yearling and subyearling Chinook salmon and steelhead smolts as they enter the marine environment. We highlight how behavior may be influenced by tidal patterns and timing of ocean entry during the migration period. Furthermore, we present the utility of the JSATS as a tool capable of tracking salmonid smolts in the marine environment. Information gathered from this study will inform experimental design of future survival studies and will provide a greater understanding of the relative importance of smolt behavior at ocean entry. A total of 8,159 unique JSATS-tagged yearling Chinook salmon (n = 3,500), steelhead (n = 1,748), and subyearling Chinook salmon (n = 2,911) were detected at the mouth of the Columbia River on the arrays located at river kilometer (rkm) 8.3, 4.5, and/or 2.8 (rkm measured as distance upstream from the mouth of the Columbia River). A total of 1,701 tagged fish were detected on the plume array, with yearling Chinook salmon (n = 638), steelhead (n = 202), and subyearling Chinook salmon (n = 861) detected between 5 May to 7 August 2010. 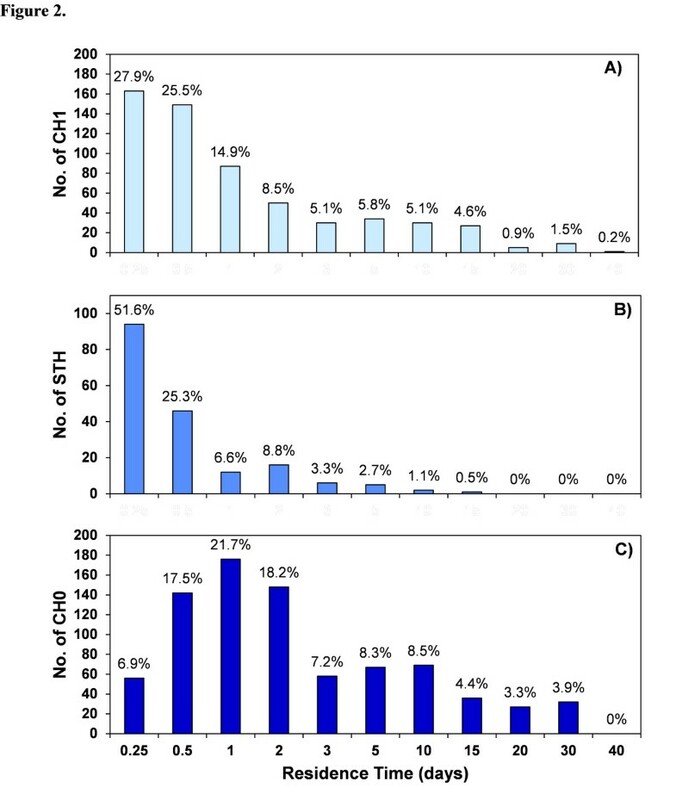 An estimated 16% of yearling Chinook salmon, 10% of steelhead, and 26% of subyearling Chinook salmon that exited the river mouth arrays were detected on the plume array (Table 1). Range tests in the plume environment in 2009 revealed detection efficiencies (percentage of transmissions detected and decoded) that averaged about 20% at 100 m and between 5% and 10% at 150 m. Valid detections of JSATS transmitters occurred up to 250 m away from the receiver. Detection probabilities for each species were applied to the number of detections at the plume array (CH1 = 0.85, STH = 0.83, CH0 = 0.89). CH1, yearling Chinook salmon; STH, steelhead; CH0, subyearling Chinook salmon. Median travel rates of Chinook salmon, particularly subyearling Chinook salmon, decreased between the river mouth and plume arrays, while steelhead travel rate increased in that area (Table 2; Figure 1). 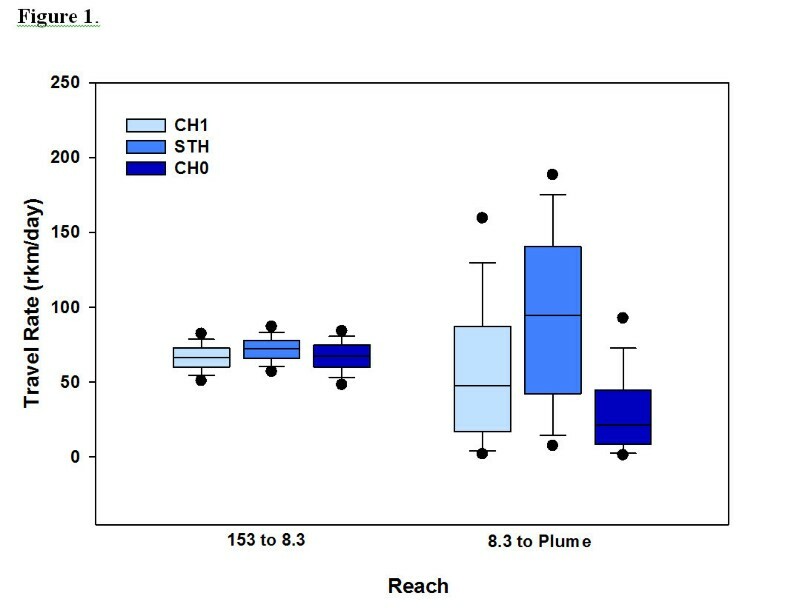 Travel rates in the lower river and estuary between rkm 153 and 8.3 were generally similar among the species/stocks of tagged fish and became highly variable between rkm 8.3 and the plume array compared to travel rates in upstream reaches (Figure 1). Early season detections include 5 to 18 May 2010 and late season detections include 19 May to 7 June 2010 for yearling Chinook salmon and steelhead. Travel rate was calculated from the last detection at the mouth of the Columbia River (rkm 8.3, 4.5, 2.8) to the first detection on the plume array. CH1, yearling Chinook salmon; STH, steelhead; CH0, subyearling Chinook salmon. Travel rate for emigrating yearling Chinook salmon, steelhead, and subyearling Chinook salmon smolts. Travel rate (rkm/day) is presented for two reaches, from rkm 153 and 8.3 and from the river mouth (rkm 8.3) to the plume array. Horizontal lines within each box represent median travel rate, ends of boxes represent the 25th and 75th percentile, and whiskers represent the 10th and 90th percentiles. The black dots represent the 5th and 95th percentile outliers. CH1, yearling Chinook salmon; STH, steelhead; CH0, subyearling Chinook salmon. Some fish were detected re-entering the river after being detected on the plume array. Most of the fish re-entering the river were subyearling Chinook salmon (n = 59), although yearling Chinook salmon (n = 4) and steelhead (n = 1) were also detected back in the river after being detected on the plume array. While most of the fish that returned to the river were detected on one of the arrays at the mouth, one returning subyearling Chinook salmon returned as far upstream as rkm 22 (Astoria-Megler Bridge). In addition, several subyearling Chinook salmon (n = 14) and two yearling Chinook salmon that re-entered the river were detected a second time on the plume array at a later date. Movement of fish from the mouth of the Columbia River to the plume array happened predominantly during periods of ebbing tides, while movements back into the river from the plume array occurred most often during flood tides. Of the 811 subyearling Chinook salmon that were detected both at the mouth of the river (rkm 8.3, 4.5, or 2.8) and by the plume array, 668 (82%) were last detected in the river on an ebb tide (chi-squared = 146.34, degrees of freedom (df) = 1, P <0.001). Of the 59 subyearling Chinook salmon re-entering the river, only 8 (14%) were first detected back in the river on an ebb tide, with the remaining 51 (86%) being detected during a flood tide. Of the three species/stocks examined, steelhead exhibited the lowest residence time in the transition area between the Columbia River mouth and the plume array (mean = 0.6 days, SD = 1.2 days, median = 0.2 days; Table 3). Steelhead travelled relatively quickly out of the plume, with over 50% of steelhead taking fewer than 6 hours to travel from the mouth of the river to the plume array (Figure 2). Comparatively, yearling Chinook salmon spent more time in the transition area (mean = 2.2 days, SD = 4.4 days, median = 0.5 days; Table 3), with 68.3% of yearling Chinook salmon travelling from the mouth to the plume array within a 1-day period (Figure 2). Subyearling Chinook salmon had the longest residence times in the transition area between the mouth of the Columbia River and the plume array (mean = 3.6 days, SD = 5.7 days, median = 1.2 days; Table 3), with the majority of fish taking between 12 hours and 2 days to migrate from the river mouth to the plume array (Figure 2). Early season detections include 5 to 18 May 2010 and late season detections include 19 May to 6 July 2010 for yearling Chinook salmon and steelhead. Residence time was calculated from the last detection at the mouth of the Columbia River (rkm 8.3. 4.5, and 2.8) to the last detection on the plume array. CH1, yearling Chinook salmon; STH, steelhead; CH0, subyearling Chinook salmon. Residence time for emigrating juvenile salmonids between the river mouth and plume array. Residence time (days) was calculated using the last detection at the Columbia River mouth to the last detection on the plume array for (A) yearling Chinook salmon, (B) steelhead, and (C) subyearling Chinook salmon. CH1, yearling Chinook salmon; STH, steelhead; CH0, subyearling Chinook salmon. As steelhead and yearling Chinook salmon exited the plume array, the majority were detected on the terminal and south sub-arrays during the early spring, prior to 18 May 2010 (Figure 3; Figure 4). However, between 18 May and 18 June 2010, steelhead and yearling Chinook salmon were primarily detected on the terminal and north sub-arrays (Figure 5; Figure 6). During the early period, between 5 May and 17 May, nearshore ocean currents were directed primarily southward. The average daily ocean current direction during this time ranged from -59° to -127° (mean = −90°, median = −89°) at the two eastern-most receiver locations of the south sub-array, with -90° representing a due south current. Conversely, the average daily ocean current direction from 18 May through 9 June 2010 ranged from -151° to +168°, with +90° representing a due north current. Despite the large range, most (16 of 23) days had northerly currents that ranged from +80° to +168° (mean = +135°, median = +140°). The difference in median daily average current directions was significantly different between the two time periods at both receiver locations (Mann–Whitney U ≥25, P <0.001). In the summer season, between 19 June and 7 August 2010, the majority (55%) of subyearling Chinook salmon were detected on the north sub-array (Figure 7). A higher proportion of yearling Chinook salmon was detected on the terminal sub-array than steelhead or subyearling Chinook salmon. Migratory behavior in the plume array for yearling Chinook salmon, 28 April to 18 May 2010. The graduated circular symbols represent the proportion of detections per days deployed at each receiver. All detections represented here are last detections as fish exited the plume array. Receivers in each of the north (green circles), south (yellow circles), and terminal (red circles) plume sub-arrays are shown. The black star indicates a higher proportion of fish detected at a receiver than indicated by the size of the symbol. Migratory behavior in the plume array for steelhead, 28 April to 18 May 2010. The graduated circular symbols represent the proportion of detections per days deployed at each receiver. All detections represented here are last detections as fish exited the plume array. Receivers in each of the north (green circles), south (yellow circles), and terminal (red circles) plume sub-arrays are shown. Migratory behavior in the plume array for yearling Chinook salmon, 18 May to 18 June 2010. The graduated circular symbols represent the proportion of detections per days deployed at each receiver. All detections represented here are last detections as fish exited the plume array. Receivers in each of the north (green circles), south (yellow circles), and terminal (red circles) plume sub-arrays are shown. Migratory behavior in the plume array for steelhead, 18 May to 18 June 2010. The graduated circular symbols represent the proportion of detections per days deployed at each receiver. All detections represented here are last detections as fish exited the plume array. Receivers in each of the north (green circles), south (yellow circles), and terminal (red circles) plume sub-arrays are shown. Migratory behavior in the plume array for subyearling Chinook salmon, 19 June to 7 August 2010. The graduated circular symbols represent the proportion of detections per days deployed at each receiver. All detections represented here are last detections as fish exited the plume array. Receivers in each of the north (green circles), south (yellow circles), and terminal (red circles) plume sub-arrays are shown. The receiver located at the south end of the terminal array was flooded during this part of the sampling period. The current study provides an examination of travel rate, residence time, and direction of travel upon ocean entry for acoustic-tagged yearling Chinook salmon, juvenile steelhead, and subyearling Chinook salmon at the mouth of the Columbia River and in the nearshore marine environment within the vicinity of the plume. Travel rate varied across species and age class, with steelhead smolts migrating out of the mouth of the Columbia River at a greater rate than yearling and subyearling Chinook salmon. Juvenile steelhead displayed shorter residence times in the transition area between the river mouth and the plume array than Chinook salmon smolts, although the majority of fish across species and age classes had residence times less than 3 days. Direction of travel upon exiting the river mouth also varied across species, age class, and season. We showed that smolt emigration from the river is highly influenced by outgoing tides and direction of tagged fish movement in the nearshore marine environment may be affected by ocean currents. This study also proved JSATS to be an effective tool for monitoring fish behavior in the marine environment. Differences in travel rates between species at ocean entry and high variation in travel rates at the river mouth/plume array transition area may be associated with the level of smolt preparedness for ocean entry (for example, physiological, bioenergetics, size), tidal action, predation risk, channel morphology, and hydrologic characteristics [8, 14, 23, 39]. Depending upon timing of fish arrival at the mouth of the river, some fish may move into the ocean within a single tide change, whereas others may require multiple tide changes before moving out into the plume on a strong ebb tide. In trawl catches, Emmett et al. observed higher subyearling Chinook salmon densities in the plume during ebb tide conditions and Clements et al. observed tidal influences on juvenile salmonid migration in the Nehalem River estuary. This is consistent with our finding that most subyearling Chinook salmon were last detected in the river during ebb tide conditions. Cross-channel distribution of emigrating smolts at the river mouth may affect travel rate depending on the route taken through the lower reaches of the estuary, as fish in different areas of the channel may experience different water velocity and flow direction due to complexities in channel morphology and tidal influence . In freshwater environments, steelhead are typically larger and often migrate closer to the water surface, whereas Chinook salmon smolts tend to utilize deeper water [40, 41]. Thus, steelhead may use the higher velocity upper layer of freshwater to facilitate more rapid movement out of the river mouth with ebb tides, even though their larger size and orientation in the water column may present a greater risk of avian predation . Short residence times have also been observed for juvenile steelhead smolts migrating out of the Nehalem River and Alsea River estuaries towards the ocean [23, 39]. Subyearling Chinook salmon exhibited greater residence time in the transition area between the river and the plume arrays than yearling Chinook salmon or steelhead smolts. De Robertis et al. suggested that juvenile salmonids use the low salinity plume waters as nursery habitat. However, it appears from the results of our study that most of the fish (steelhead smolts in particular) spent minimal time (that is, less than 3 days) within the confines of the plume array and migrated out to the ocean relatively quickly rather than using this habitat for rearing. Most tagged fish were last detected at the river mouth arrays (rkm 2.8, 4.5, and 8.3) during ebb tides, which could have facilitated fish movement out of the river and into the plume. Of the subyearling Chinook salmon that moved back into the estuary, the majority did so during a subsequent flood tide. It is also possible that some juvenile salmonids in this study may have been eaten by predators, thus transferring the tag from smolt to a larger predatory fish, possibly explaining the movement in and out of the mouth of the river, which may have been characteristic of a predatory species, rather than a juvenile salmonid. During early spring, prior to 18 May 2010, the majority of yearling Chinook salmon and steelhead smolts in our study were detected on the terminal and south sub-arrays in the plume. Conversely, previous studies have reported that yearling Chinook salmon and steelhead nearly always exit the Columbia River mouth by migrating northward [35–37]. Schreck et al. placed two receiver lines off the north and south jetties and Rechisky et al. placed a receiver array 131 km south of the Columbia River mouth (near Cascade Head, OR). The authors concluded in these former studies that very few smolts migrate south when exiting the Columbia River. It is clear, however, from the results of our study that many yearling Chinook salmon smolts (27%) and steelhead (47%) initially migrated south upon ocean entry. An array deployed at the river mouth off the south jetty by Schreck et al. detected 12% of tagged Chinook salmon and 23% to 40% of tagged steelhead. The Cascade Head array deployed by Rechisky et al. was located considerably farther south of the Columbia River mouth and only detected two fish (1%) tagged and released as part of a group (n = 196) transported by barge early in the season (April). Of the total number of fish tagged by Rechisky et al. (n = 977), these two tagged smolts detected on the Cascade Head array were 0.2% of the tagged population in that study. In a separate study conducted by Pearcy and Fisher , a small percentage of coded wire-tagged yearling Chinook salmon were captured in purse seines south of the Columbia River mouth over a span of 5 years. It is uncertain how far south smolts move prior to reversing direction and migrating north. It appears, however, that direction of travel may be associated with the direction of ocean currents and potentially other ocean conditions (for example, current and wind direction, salinity, temperature) experienced by juvenile fish at the time they enter the marine environment. We found the direction of fish movement in the nearshore ocean to be associated with southerly ocean currents prior to 18 May 2010, followed by a reversal in the direction of both fish movements and ocean currents thereafter. Surface currents are influenced by wind direction and our observations suggest that migration direction of tagged smolts may have also been affected by these conditions. Therefore, it is possible that differences in surface current dynamics (and smolt migration behavior) among years may explain some differences in migration direction observations between past and present studies. Although our box array design expanded on previous findings regarding the direction of movements in the nearshore ocean, a detailed study of juvenile fish behavior in relation to oceanic conditions is necessary to gain a better understanding of how the environment affects fish movement. Due to the dynamic nature of the plume, surface current direction is not static and conditions may change within a matter of days or hours [30, 31]. Therefore, pairing acoustic telemetry receivers with devices (for example, acoustic Doppler current profilers) deployed to collect environmental data would further expand our ability to associate fish movement with ocean conditions. Distribution of the two species of salmonids (of varied age classes) tagged in our study varied within the plume array, as more yearling Chinook salmon were detected on the terminal sub-array than steelhead or subyearling Chinook salmon. Fisher et al. reviewed data from juvenile salmonid trawls along the west coast and concluded that subyearling Chinook salmon were mostly distributed closer to shore in shallow water. This is consistent with our findings that most subyearling Chinook salmon were detected on the plume array north of the Columbia River and their distribution was skewed toward the shallower water off the beach. Given the large number of smolts in our study that were last detected on the terminal sub-array (located along the 100 m depth contour), it is possible that some fish move on to migrate over deeper water beyond the continental shelf, which is generally considered to be at the 200 m depth contour. Past studies have also found distributions of yearling Chinook salmon similar to our study [33, 45], while others report yearling Chinook salmon being distributed somewhat closer to shore . Many other studies, however, have shown inconsistencies in catch densities and distribution patterns of juvenile salmonids in the Columbia River plume across seasonal and annual sampling periods [24, 43, 44]. Burla et al. suggested yearling Chinook salmon are likely to spend more time in the overall low-salinity plume habitat, staying closer to shore before moving north in May to July, whereas steelhead use the plume to quickly disperse from coastal habitats. However, De Robertis et al. found that yearling Chinook salmon were abundant throughout the entire plume. Due to attenuation of acoustic signals in marine environments, the detection range of JSATS was reduced in saltwater compared to freshwater (by approximately 50%; McMichael et al. ). We suspect the plume array detection efficiency was considerably lower compared to the arrays located at the river mouth because the spacing between receivers was larger in the plume array (approximately 3 km versus 150 m in the river) and the water within the plume array was more saline. Therefore, many tagged fish likely passed the box-shaped plume array undetected. In range testing conducted in the plume in 2009 with the receiver deployed in approximately 55 m of water, we determined that detection efficiency averaged about 20% at 100 m and between 5% and 10% at 150 m, while the greatest distance for valid detections of a JSATS transmitter occurred 250 m away from the receiver. These detection efficiencies are approximately half of those we have measured in freshwater and will be an important consideration in future array designs in plume and marine environments. Other studies have speculated that salmon smolts utilized waters nearer the surface in the plume [34, 43], and it is possible that fish closer to the surface (farther from the receivers near the sea floor) were not detected as efficiently as those travelling at greater depth. For example, a larger percentage of the subyearling Chinook salmon (26%) estimated to have left the river were detected on the plume array than either yearling Chinook salmon (16%) or steelhead (10%). From these data we might conclude that the deeper travelling subyearling Chinook salmon were closest to the relative position of the receivers in the water column and steelhead were farthest as they migrated closer to the surface, with the yearling Chinook salmon at intermediate depth. It is also possible that the tendency for subyearling Chinook salmon to migrate more slowly and closer to shore in areas where the total depth of the water was relatively shallow may have increased the detection efficiency of their transmitters. This study documents the successful use of the JSATS to track fish behavior in the nearshore marine environment. Further use of this technology in the future could improve array design by reducing the spacing between receivers, adding additional lines in a ‘net-like’ formation (that is, placing receivers outside of the current array intermittently between receivers in the existing formation at varied distances) outside of the box array and providing more extensive coverage up and down the continental shelf to better account for spatial variation of the oceanographic conditions in and around the plume, up and down the coast, and beyond the edge of the continental shelf. Expanding the array could help to elucidate direction of travel after juvenile salmonids exit the plume box array and allow for improved quantification of distance travelled by southward moving smolts. Adding additional receivers outside of the box array may also allow for estimation of smolt survival in the nearshore ocean environment using mark-recapture methodology. Finally, pairing receivers with devices deployed to collect environmental data may also help to identify conditions associated with fish behaviors, such as movement. Multiple years of telemetry data are necessary to observe the behavior of juvenile salmonids in the nearshore ocean under different environmental conditions. Telemetry receiver array improvements will help provide more extensive and longer term smolt survival information and also help to capture fish behavioral responses to changing conditions. Because the transition between the river and ocean has been identified as a critical period that influences smolt-to-adult survival rates, these additional data sets will provide needed information to run forecasting models [29, 47]. In addition, the continued use of the JSATS will allow for smaller size classes (that is, <95 mm fork length (FL)) than ever before to be monitored, providing a more accurate representation of behavior characteristic to the population. Previously, most telemetry studies in the nearshore ocean have utilized lower frequency acoustic transmitters (for example, 69 kHz) that may potentially be within audible range of predatory marine mammals [48, 49]. JSATS transmitters have frequencies that are outside the audible range of marine mammals (416.7 kHz) and may reduce any potential study bias associated with predation. This study documents that the JSATS has successfully been used to monitor salmonid behavior in the nearshore marine environment and the small transmitter size allowed for small fish (≤95 mm) to be tagged and detected as they migrated into the ocean. We also show evidence that juvenile salmonids tend to migrate out of the mouth of the river with ebbing tidal action, the direction of nearshore movements may be associated with ocean currents, and that outmigration rate, residency, and direction of travel vary across species and age class. We recommend that future studies combine behavioral telemetry, trawl, and acoustic studies in the Columbia River plume with detailed oceanographic data to enhance knowledge regarding juvenile salmonid habitat use upon ocean entry. Such information will be useful for establishing fisheries management practices such as timing hatchery releases or fish transportation programs (for example, Ward et al. ) to correspond with optimal ocean conditions. Early ocean experience is hypothesized to be one of the most influential factors in juvenile survival , and an enhanced understanding of lower river, estuary, and early ocean survival will help inform management strategies for both freshwater and marine phases of salmonid life history. Fish were handled in accordance with federal guidelines for the care and use of laboratory animals, and protocols were approved by the Institutional Animal Care and Use Committee, Battelle-Pacific Northwest Division. Run-of-river yearling Chinook salmon, steelhead, and subyearling Chinook salmon smolts were collected from the juvenile bypass system at John Day Dam (rkm 347) and tagged during the spring and summer of 2010. Additional yearling Chinook salmon were tagged on the Snake River at Lower Granite Dam (rkm 695) for release from fish transport barges downstream of Bonneville Dam. These additional yearling Chinook salmon were tagged for a different study (see McMichael et al. ) and were included in the current study to increase sample sizes. After collection from the juvenile bypass facility, each fish was held in holding tanks supplied with flow-through river water for 18 to 30 hours prior to surgery. Immediately prior to tagging, all fish were anesthetized using MS-222 (80 mg/L) to stage four level anesthesia . Information on species, presence of adipose fin clip, FL (mm), and weight (g) were recorded for each fish. A 6 to 8 mm incision was made on the linea alba (ventral midline), anterior of the pelvic girdle and posterior of the pectoral fins. Both a passive integrated transponder (PIT) tag and a JSATS acoustic transmitter were inserted into the peritoneal cavity of each fish and the incision was closed with two simple interrupted sutures (5–0 absorbable monofilament suture material). During surgery, each fish received a maintenance dose of 40 mg/L MS-222 anesthesia. Tagged fish were allowed to recover in holding tanks supplied with continuous fresh river water for 18 to 30 hours until release. All fish were tagged with the 2010 model JSATS transmitters (Advanced Telemetry Systems, Isanti, MN, USA). Transmitters averaged 5.21 mm (standard error (SE) = 0.01) wide, 12.00 mm (SE = 0.01) long, and 3.77 mm (SE = 0.04) high. Mean transmitter weight in air was 0.43 g, mean weight in water was 0.29 g, and mean volume was 0.14 mL. The pulse rate interval (PRI) was 3 seconds and estimated tag life was about 30 days. PIT tags (Model TX1411SST; 12.5 × 2 mm; weight in air = 0.10 g, weight in water = 0.06 g; Destron Fearing, South St Paul, MN, USA) were implanted to allow for detection of fish at juvenile bypass facilities and adult fish ladders. When combined, the weight of both the acoustic transmitter and PIT tag was 0.53 g (in air) and tag burden was calculated as the percentage of tag weight to the weight of the fish. Minimum fish size for tag implantation was 95 mm FL in order to minimize tag burden. Yearling Chinook salmon (n = 3,880) and steelhead (n = 3,885) smolts were released between 28 April and 1 June 2010 at John Day Reservoir at Roosevelt (rkm 393), Hood River (rkm 275), and The Dalles Dam tailrace (rkm 307) (Table 4). Additional yearling Chinook salmon (n = 1,392) tagged at Lower Granite Dam were transported by barge and released downstream of Bonneville Dam (rkm 224) between 30 April and 14 May 2010 (Table 4). Subyearling Chinook salmon (n = 4,449) were released between 13 June to 17 July 2010 from John Day Reservoir, Hood River, and The Dalles Dam tailrace (Table 4). Yearling Chinook salmon, steelhead, and subyearling Chinook salmon were released at sites located between rkm 224 and 393 on the Columbia River. CH1, yearling Chinook salmon; STH, steelhead; CH0, subyearling Chinook salmon. 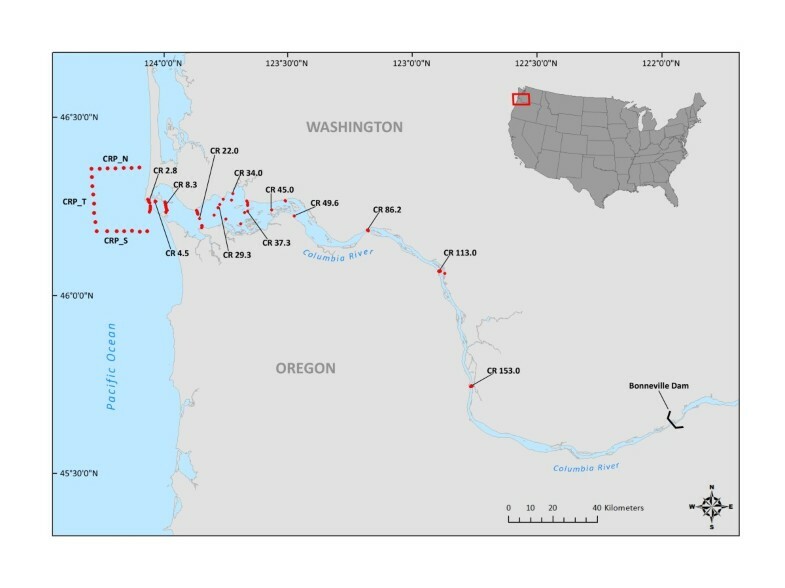 JSATS autonomous receiver nodes (Model N201; Sonic Concepts, Inc, Bothell, WA, USA) were deployed in arrays located in the lower Columbia River, estuary, and vicinity of the plume between 27 April and 7 August 2010 (Figure 8). Detailed JSATS receiver deployment and mooring methods are described in Titzler et al. and McMichael et al. . Six arrays were deployed between rkm 153 (Knapp Point, downstream of Willamette River) and rkm 22 (Astoria-Megler Bridge). For details on array locations from rkm 22 to rkm 86, see Harnish et al. and McMichael et al. for array locations between rkm 86 and rkm 153. Two receiver arrays were deployed at the river mouth at rkm 8.3 (East Sand Island) and rkm 2.8 (Columbia River Bar, between the jetties). Three receivers were moved from the north end of the array at rkm 2.8 and redeployed at rkm 4.5 around Jetty A for 57 days (June 11 to August 7 2010; Figure 8) to accommodate channel maintenance activities. The focus of this paper is on the arrays located downstream of rkm 22 to the river mouth and in the vicinity of the plume. Data from arrays located between rkm 153 and rkm 8 are only provided for comparative purposes. The arrays at rkm 8.3 (n = 22 receivers), rkm 4.5 (n = 3 receivers) and rkm 2.8 (n = 27 receivers) were deployed primarily for estimation of survival through the lower 230 km of the Columbia River. However, for this study, data from these arrays were used to determine travel rate, travel time, and residence time through the lowest reach of the estuary and into the marine environment. Each array was deployed perpendicular to the river bank, with receivers spaced about 150 m apart. Every 28 days receivers were recovered to download data, replace batteries, perform system tests, and then redeployed. To estimate the number of fish leaving the mouth of the river and entering the plume array, the number detected was divided by the detection probability on the array at rkm 8.3 (yearling Chinook salmon = 0.85, steelhead = 0.83, subyearling Chinook salmon = 0.89; McMichael et al. ). Twenty additional receivers were deployed in the transitional zone surrounding the mouth of the river in the vicinity of the Columbia River plume to determine travel rate, residence time, and direction of migration as smolts move into the nearshore marine environment after exiting the river mouth. Plume array receivers were arranged in a box formation around the mouth of the river with the terminal sub-array (n = 6 receivers) located about 15 km off the south jetty, along the 100 m depth contour. The north and south sub-arrays consisted of seven receivers each. Internode spacing was approximately 3 km and each hydrophone was positioned approximately 6 to 8 m off the ocean floor. One receiver located at the south end of the terminal sub-array was flooded after 18 June and data were lost at this location between 19 June and 7 August 2010. JSATS autonomous receiver array locations. Receiver arrays were deployed in the Columbia River from rkm 153 to the mouth (rkm 8.3 and 2.8) and in a three-sided box array arranged in the Columbia River plume. Prior to the commencement of the current study, range testing was conducted in the vicinity of the Columbia River plume in 2009 with a receiver deployed in approximately 55 m of water. Detection efficiency was expressed as the percentage of transmissions detected and decoded at a position a certain distance away from the position over a receiver near the sea floor in 55 m of water. Data files downloaded from the receivers were stored in a database specifically developed for JSATS data. All data were filtered for false detections, first, by comparing each detection to a list of tags that were released and removing any detections from tags that were not released. Second, by comparing detection dates against release dates so that only tags detected after release dates were retained in the database. Third, a minimum of four detections was required from the same tag within 36 seconds and had to occur in multiples of the PRI of the tag to be considered a valid detection. All data filtering was completed using a post-processing program. Travel time, travel rate, and residence time calculations only included fish that successfully migrated through both the upstream and downstream arrays and were detected on both arrays bounding the region of interest. Travel time was calculated for each fish detected at both the upstream and downstream arrays by subtracting the date and time of the last detection on the upstream array from the date and time of the first detection on the downstream array. Travel rate was calculated by dividing the travel time by the distance between arrays. In the plume array, travel rate was calculated based on last detections at rkm 8.3, 4.5, or 2.8 (whichever of the three arrays the fish were last detected on) and the first detection at any receiver on the plume array. Travel rate was calculated between rkm 153 to rkm 8.3 and between rkm 8.3 to the plume array. Residence time in the transition area at the river mouth and in the plume array was calculated by subtracting the date and time of the last detection at rkm 8.3. 4.5, or 2.8 from the last detection on any of the plume array receivers. Spatial distributions of juvenile salmonids were based on last detections on individual receivers in the plume array. To account for limited receiver downtime and uneven numbers of receivers on the sub-arrays, relative distribution of final detections on the plume array was calculated by dividing the 20 receivers into three sub-arrays (north, south, and terminal). The number of uniquely tagged individuals last detected on receivers in the three sub-arrays was divided by the total number of days each receiver was deployed to estimate the overall direction of travel as smolts exited the plume array. 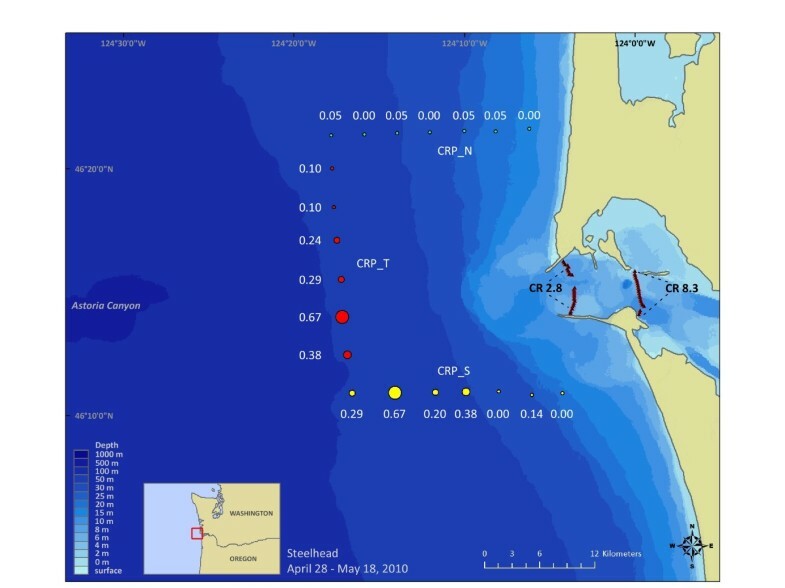 Nearshore ocean current data were obtained for the two eastern-most receiver locations of the south sub-array from the College of Earth, Ocean, and Atmospheric Sciences at Oregon State University, OR website (http://bragg.coas.oregonstate.edu; Mike Kosro). Surface currents available from this source are measured by sending radio waves from two separate radio transmitters on land, one located near Fort Stevens, OR and the other near Seaside, OR. The radio waves are scattered from ocean waves, and received again on land by a receiver at each location. The direction of the current is determined using data from multiple receivers using established methods [54, 55]. Comparisons of daily average ocean currents between time periods were made at each location by first testing for normality in the data using the Shapiro-Wilk normality test (α = 0.05). Since the data were not normally distributed (P <0.001), the Mann–Whitney U test was used to test for significant (α = 0.05) differences. The relationship between direction of travel and tide stage was examined by comparing the magnitude and direction of tide change with the departure and arrival times of tagged fish. The hourly change in predicted tide height at the Hammond, OR (near rkm 8.3) tide gauge was determined for the departure (last detection) times of subyearling Chinook salmon that were subsequently detected on the plume array. Similarly, for subyearling Chinook salmon detected upon re-entering the river mouth, the magnitude and direction of hourly tide stage was determined for the times of the tagged fish’s first detection back in the river mouth area. A chi-square test (α = 0.05) was used to compare the proportions of subyearling Chinook salmon that left or returned to the estuary during flood and ebb tides. This work was funded by the US Army Corps of Engineers, Portland, OR, USA. The technical leads for the Corps were Blaine Ebberts and Cynthia Studebaker. We are grateful to them for the technical guidance and support to perform this work. A large number of Pacific Northwest National Laboratory (PNNL) staff from the North Bonneville office worked very hard to collect, tag, and release the fish used in this project. In particular, the contributions of Mark Weiland, Gene Ploskey, and Derrek Faber, and their excellent crews are greatly appreciated. Richland and Sequim PNNL staff provided tireless support in the field (Kate Deters, Kate Hall, Mike Hughes, and others), as well as with data analyses (Kenneth Ham), and preparation of graphics (Chris Vernon) for this paper. We would also like to thank the Northwest Association of Networked Ocean Observing Systems (NANOOS) for sponsoring surface current measurements by the College of Earth, Ocean, and Atmospheric Sciences at Oregon State University and Mike Kosro who provided ocean surface current data and guidance for its use. We also thank Sean Hayes and one anonymous reviewer for their insightful and helpful comments and suggestions. GM conceived of the project and participated in all aspects of the research and manuscript preparation. AH, RH and DT each had significant involvement in the data analyses, interpretation, and manuscript preparation. All authors read and approved the final manuscript.